When was the last time you trained your managers on how to spot and address harassment? It’s no secret that harassment in the workplace is on everyone’s mind. Many organizations have been proactive in developing policies and procedures, updating employee handbooks, and making sure information is posted for employees to learn what their rights in the workplace are. However, many organizations fail to address one of the most critical links in the chain to prevent and address harassment…training supervisors on harassment prevention. Supervisors are the people who will most likely hear about possible harassment first…and they need to know what to do to protect employees, your organization, and themselves. Our program is tailored to your organization and utilizes the work you have already done…in addition to our content we leverage your handbook, policies, and internal practices to reinforce all these elements in a seamless fashion. The workshops are informative, engaging, and fun. 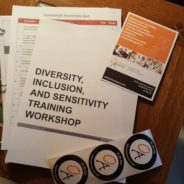 Learn more about our harassment prevention tools here and all of our training workshops on our website.